Last night I went through my infamous recipe binder and pulled every. single. recipe. that can be cooked on a grill. Yes I did. I asked my husband if he will be annoyed cooking on a grill every night and he said no, because he loves grilling. He has officially requested for me to buy him an apron that says “Grill Master” or something similar. =P I am enjoying the grilling, too, because it is more of a joint effort. I pick out the recipes and prep them, while he grills them as I make the sides. It keeps him off his video game, also! ;);) (that being said, he’s not freakishly obsessed with his games, I just want to make that clear). 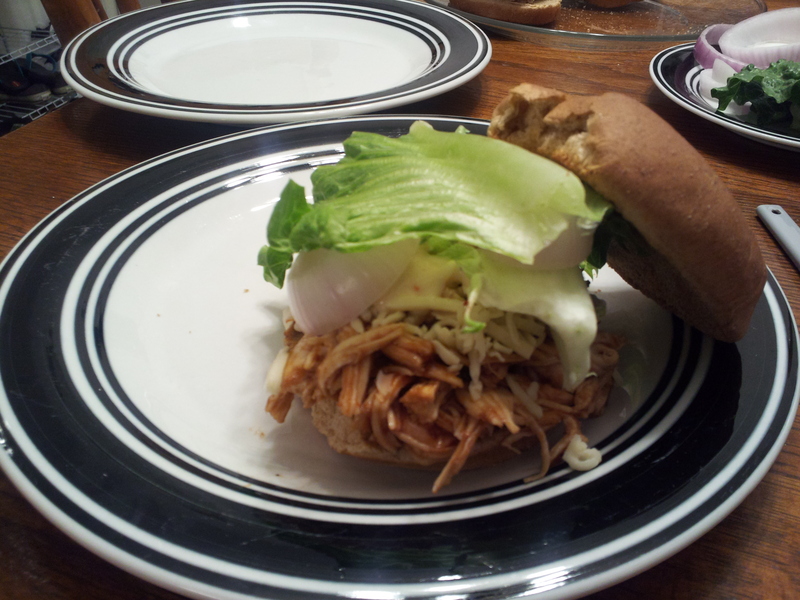 Last night we made these BBQ Ranch Shredded Chicken Sliders (see above for a picture of just the slider, and see below for a picture of the whole meal) but we made them as regular burger-sandwiches, as opposed to sliders. I paired them with a salad of fresh spring greens. Funny story about the salad – I put a few small squirts of dressing on the salad and mixed it well. As my husband went to scoop some onto his plate, he started to add more dressing and I told him I already included dressing. His response? “Where? I don’t see any dressing!” This is a common theme in our house. I put on a lot of something, and then he proceeds to add more. Unless it’s cheese. Or croutons. Or hot/spicy spices/sauce. Then it’s me piling that on. In any case, the sliders were delicious! It was basically barbecue chicken. I used caesar dressing instead of ranch, since we only had a tiny bit of ranch and I think it has been in the fridge for awhile so I didn’t want to risk it. -Preheat grill (and then obviously grill them). -Shred chicken into a bowl, mix with barbecu sauce until thoroughly combined. -While doing the above step, you can toast the buns on the grill, too. 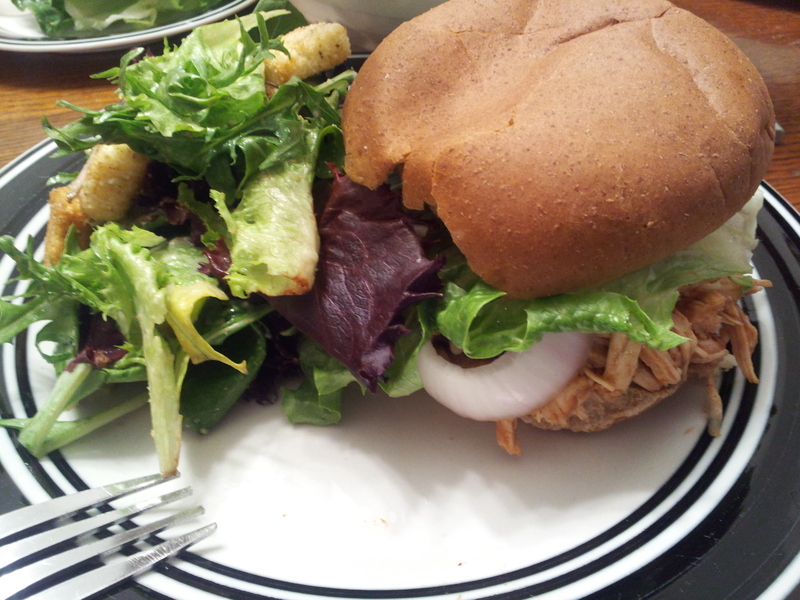 -On each slider bun, add a few spoonfuls of shredded chicken. Top with a teaspoon of ranch dressing, and a piece of cheese. Add lettuce and other garnish.